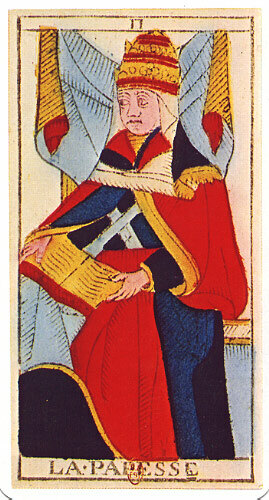 Illustration (right): The Papess from Tarot de Marseille by Nicolas Conver (1761), re-published by Héron. Click on the image for a larger one. Illustration (left): The High Priestess from Builders of the Adytum [BOTA] Tarot Deck (c. 1930), designed by Paul Foster Case and drawn by Jessie Burns Parke, adapted from The Tarot: A Key to the Wisdom of the Ages by Case (copyright &COPY; 1947 Case). Click the image for a larger one. 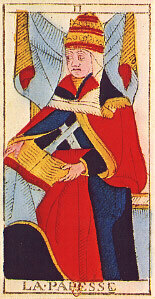 Symbol (above): It depicts a scroll called TORA, which is often held by the figure in this Arcanum.